What happens when a book cover catches your eye but gives you pause? 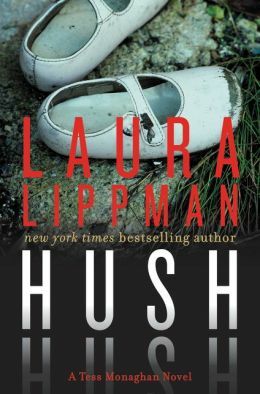 Laura Lippman is a New York Times bestseller. Her name appears prominently above the title in bold red letters. The title, Hush, appears in white letters faintly mirrored against a black background. As a mystery suspense thriller these colors are a trifecta. Lippman’s name alone is likely to draw interest and sell copies. So where might one have reservations about the book? That comes from the very apparent image of two shoes, a child’s shoes. Shoes most likely for a toddler discarded or placed on the ground on top of dirt and grass. The shoes themselves appear scuffed, dirty, and empty. This Tess Monaghan novel must be about a child. Killed, kidnapped, or worse…this is a subject that will give readers pause. Fortunately it would seem the novel doesn’t dwell too intensely on this initial, gruesome crime that so readily fits the model of “ripped from the headlines” stories. It is Melisandre’s present circumstances, her quest to bridge the estrangement with her teenage daughters that launches the story, whose narrative is interspersed with transcripts of interviews, presumably conducted as part of a documentary about Melisandre. Still any novel dealing with crimes against children are difficult for some readers. They are not for everyone. The question of what really happened is certain to be addressed before novel’s end, but I suspect Hush is “safer” than most and not likely to be overly graphic in dealing with such dark issues. So while the cover here catches the eye, it may serve as more of a reminder to sample this well-known author by starting with an earlier book, or preferably the first, in this long-running series.